We would like to introduce our new author interview series, Deviant Author Interviews! In this series, you’ll get to know the deviant minds behind some of New Orleans’s most talented writers through five rapid fire questions that are sure to bring out their idiosyncrasies. Get ready, because this isn’t your ordinary interview! 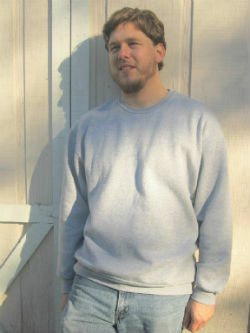 The first author who graciously agreed to be interviewed is David Armand, who is also our featured author this month. David was born and raised in Louisiana, and he has an eclectic background, having worked as a drywall hanger, a draftsman, and a press operator in a flag printing factory. He currently teaches at Southeastern Louisiana University, where he also serves as associate editor for Louisiana Literature Press. His first novel, The Pugilist’s Wife, won the George Garrett Fiction prize in 2010. His second novel is Harlow, the story of 18-year-old Leslie Somers, a boy who trudges the Louisiana backwoods in search of his father, whom he has never met. Check out our review of Harlow below, and visit David’s website. You can also like his author page on Facebook and follow him on Twitter: @darmandauthor. We caught up with David about the characters of Harlow, topics he would rather not write about, the cycle of alcoholism, and his own rebellious background. So imagine the characters in Harlow are stuck on a deserted island. What are their initial reactions? Who has the best chance of getting off the island alive? I think that most of my characters wouldn’t be too surprised at being stuck on a deserted island, as the place where they come from (southeast Louisiana) is somewhat insular in its own right: towns like Sun, Amite, Folsom, etc., can be like deserted islands themselves, those lone blinking yellow caution lights swaying from the electric wire in the middle of town, the silence. It’s almost ghostly. I think that the boy Leslie from Harlow has the best chance of getting off that island, though. After all he’s been through, it should be no big deal to him. He’ll find a way to survive. Name a topic that you refuse to write about and why. Anything political. I am apolitical by nature, and I just don’t like polemical art. Which character in Harlow do you wish you could switch places with and why? As the characters in my books go through some pretty bad stuff, I honestly would not want to have to walk a foot in any of their shoes! That being said, I’ve already done a little bit of walking, probably, in each of their shoes already: you see, most of the characters in my books are amalgamations of aspects of myself. I have to say I relate the most to the boy Leslie in Harlow, and I think I could switch places with him and come out OK: heck, I pretty much already did! What fictional villain do you wish won? How would you have ended their story? I would have liked to have seen Jack Torrance in Stephen King’s The Shining survive (sorry for spoiling anything for those of you who never read it). He was a villain, sure, but he was also a victim: of disease (alcoholism) and of the ghosts haunting the Overlook Hotel as well as his own psyche. I would have liked to see him survive and overcome his demons in order to be there for his family. My dad was an alcoholic and he died when I was young, so I would have liked to see Jack Torrance “win.” On a side note, I’m currently reading Doctor Sleep, King’s sequel to The Shining, and Jack’s poor son Danny has now become an alcoholic himself. I wonder if that would have still been his fate had his father survived. It’s such a sad legacy to leave behind, it really is. The characters of Harlow are quite rebellious. What’s the most rebellious thing you’ve ever done? Can I plead the Fifth on this one? Just kidding! I’ve done some pretty rebellious things in my time, believe it or not, but since I’m assuming this is a PG-rated venue, I’ll just admit to this: When I was in high school, I skipped school two times. The funny thing was that the first time I skipped, my mom came to check me out from school that day, and I wasn’t there! The second time, my friends and I drove to the French Quarter on our “day off” and I actually saw my dad when we were coming home on the Interstate (he was on his way home from work). What are the chances? Fortunately, he didn’t see me. I ducked in the back seat! Kids: don’t skip school. It’s not worth it! To hear more from David Armand, listen to his interview with Susan Larson on The Reading Life. Have ideas for deviant questions? Let us know! We want your suggestions. E-mail us at nolafleurdelit@gmail.com. If your question gets selected, you just might uncover a special surprise! Tags: Authors, Deviant Author Interviews. Bookmark the permalink.